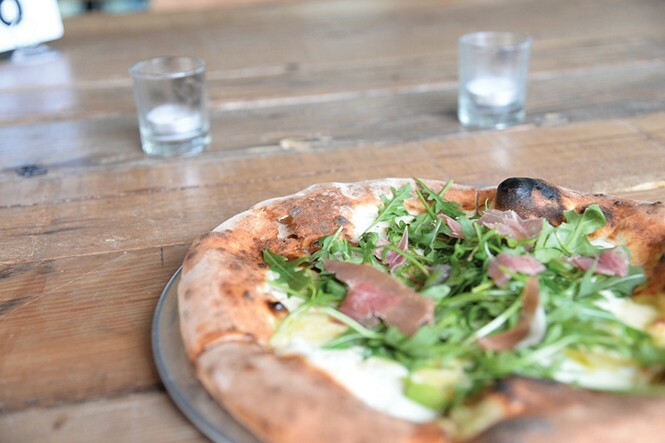 Find Neapolitan pizza perfection at 9th & 9th. And on the best day, God created pizza. Well, OK—let's not give the Big Guy all the credit. Hungry humans had a lot to do with introducing pizza into our culinary repertoire. No one really knows which wise person first used tomatoes or other ingredients as toppings on what was probably flatbread—which dates back to ancient times. The early Greeks ate a flatbread topped with garlic, herbs and onion called plakous. Food historians say the first documented case of the word "pizza" occurred in Gaeta, circa A.D. 997, and that it was a spinoff of the Romans' focaccia. Once tomatoes were introduced to Europe from the New World, pizza was all but inevitable. Someone in Naples—bless his or her soul—created what we today think of pizza by adding tomatoes sometime in the 18th century. Back then, pizza was typically sold from carts or open-air stands, usually by the slice or paper-wrapped piece. It is thought that Naples' Antica Pizzeria Port'Alba was the first indoor pizzeria in that city. Although pizza is ubiquitous in the United States today, it didn't arrive on our shores until the early 20th century. Gennaro Lombardi is credited with opening America's first pizzeria in 1905. If you ever find yourself in New York City's Little Italy neighborhood, stop by Lombardi's on Spring Street; it's still going strong. Pizza is about nothing if not diversity. It's why I'm hard-pressed to name my favorite place. After all, styles range from Chicago, New York City, New Haven and California models to Neapolitan and Sicilian, and employ various cooking methods: wood-fired, coal oven, broiler-baked, cooked in a deck oven and more. If I had to choose a style of pizza as my single favorite—akin to having to choose your favorite child—it would be Neapolitan. Purists contend there are only two authentic types of Neapolitan: marinara and Margherita. If you're a fan of this type of pizza, you're in luck because Pizza Nono has nailed it. A great Neapolitan pizza is a surprisingly simple thing—made with just a handful of ingredients—which is why it's so hard to get right. There's no hiding an inferior crust or sauce under layers of pineapple and pepperoni. A true Neapolitan pie—according to the Associazione Verace Pizza Napoletana—consists of dough made with 0 or 00 flour that must be formed by hand, and is baked in a stone oven heated with oak. The prototypical pizza Napoletana is the Margherita, which is topped with only the best quality sauce made from San Marzano tomatoes, fresh mozzarella cheese, basil and extra virgin olive oil. At the 9th & 9th neighborhood's Pizza Nono—nono means "ninth" in Italian—owner/chef Will McMaster has conquered the art of Neapolitan pizza making. His Margherita ($10) is as good as any I've ever tasted—and I've sampled hundreds. It's all about quality control, and Nono's simple and straightforward menu helps keep quality high. The menu consists of four mainstays, plus a pizza of the week. A couple of simple salads are offered—kale Caesar and an arugula—along with a seasonal side such as broccolini. That's it. Aside from the outstanding Margherita, I'd also recommend the Rocket Man ($12), topped with fresh mozzarella, fontina, prosciutto di Parma, Grana Padano and arugula. For a more contemporary take, the Beehive ($11) has tomato, fresh mozzarella, calabrese, pickled jalapeño and honey.